When the histopathological reports of blood shows presence of basophilic nuclear remnants (clusters of DNA) in the erythrocytes cells circulating in blood this is known as howel jolly bodies. Normally, the late erythroblasts present in the bone marrow expel out their nucleus. But sometimes a small quantity remains inside and this happens may be due to absence or damage of spleen in body. As the spleen is responsible for filtering the red blood cells which remains inside. For diagnostic purpose, a blood smear test is performed and the DNA of these cells may either appear as basophilic purple color spot or eosinophilic pink color erythrocyte spot on the standard H&E stained blood smear test. The main cause behind howel jolly bodies is the damaged or absence of spleen. The absence of spleen may be congenital. Spleen is removed from body due to many reasons behind it like trauma and sickle cell anemia. Heinz bodies are also known as Heinz Ehrlich bodies. Unlike howel jolly bodies it consist of denatured hemoglobin remained in the red blood cells. Heinz bodies appear as rounded bodies in the red blood cells and a specific dye test is used for its diagnosis. Romanowsky dye is of no use in diagnosing Heinz bodies instead new methylene blue, crystal violet or bromocresol green dyes are used for the diagnostic purpose. The main cause behind Heinz bodies is the damaged hemoglobin due oxidantion. This oxidant damage may be due to the medications used or due to inherited gene mutation. In this condition, the presence of oxygen molecule causes the hemoglobin to transfer its electron to oxygen making it reactive and as a result cell damage occur. The process of denaturation is irreversible and continuity of lysis lead to Heinz body anemia. Heinz bodies may occur due to the denaturing hemoglobin in the red blood cells. Due to the deficiency of G6PD, the bond between heam and globin is break and separated heam is recycled as the separated globin accumulate and form a chain which stuck in the cell membrane of the cell i.e. red blood cells. Howell bodies are the fragments of the nucleus of red blood cells remains inside it. Howell bodies are diagnosed with a blood smear test. 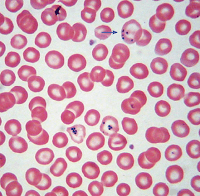 Howell jolly bodies appear as basophilic purple color spot or eosinophilic pink color erythrocyte spot on the standard H&E stained blood smear test. Howell jolly bodies occur due to either damaged or absence of spleen in body because spleen is responsible for clearing these kind of cells from body.